SpeedSport Promotions : We are the champions ! Callum MacLeod secured the Copa D'Espania title for 2009 at Barcelona, winning the title for the 06 class cars by a convincing 30 point margin. Two second places in class were more than enough to seal the title, especially as our nearest rival suffered gearbox woes throughout the weekend and scored no points at all. The Speedsport prepared Dallara, run in conjunction with Team West-Tec ran perfectly to qualify eighth overall, and Callum would have been even higher up the grid other than a red flag at the end of qualifying which meant he had to abort his quickest lap of the session. In both races a less than perfect start was followed by racing in a closely bunched pack of equally matched cars on a circuit made difficult by the rubber laid down by the F2 cars from a previous race. Callum said ; "it's been a great season, and we've had the fastest 06 car for virtually the whole year. 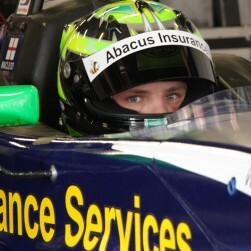 My thanks go to the team, and Jeff from Abacus Insurance Services and Richard Utley, without whom I wouldn't be racing"
Callum takes part in the asessments for the McLaren Autosport Awards on November 4/5/6, and we are already making plans for the 2010 season.